The Luch Dobra Public Union [The Ray of Kindness] was officially registered on 24 April 2013, at the initiative of several parents with children who have Down Syndrome. Ms Viktoriya Toktosunova, who has a-year-old unusual baby herself, is director. The organisation initially had two goals: an information campaign to support families with children with Down Syndrome and establishing a centre for such kids. The idea to establish a kindergarten with an inclusive education system has come around some time later. The idea was proposed by Alla Hramtsova, Viktoriya’s mother. I met these wonderful women to talk about what happened. 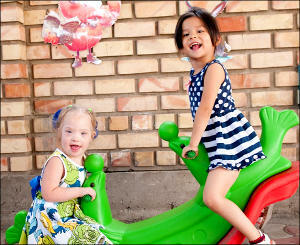 The kindergarten is housed in a small two-floor building in a private neighbourhood in Bishkek. The building has a nice yard. I notice the absence of items and objects that could potentially inflict injury such as slides, swings and monkey bars. The house itself is very clean and tidy. The first floor houses rooms for games and music classes as well as a kitchen and a dining room; a bedroom, classrooms and a bathroom are on the second floor. I visited the kindergarten during a “quiet hour” and the kids are all sleeping. Obviously, law-enforcement bodies got involved, but they launched no criminal investigation due to lack of evidence of a crime. But inspections were launched even though no single person from the ministry of education visited them over the course of two years of the kindergarten’s existence. And then, of course, there were a number of inspections by tax authorities, fire-fighting services, and sanitary administration. Claims and pretensions they had were bizarre and strange. The doctors did not how to take care of Viktoriya’s son. According to herself, the doctors prescribed various medicines for her son—to cure the Down Syndrome! “I actually did by those medicines initially. But having met other mothers and their children, I stopped administering those injections on my child. Down Syndrome is not an illness after all; we must work with such children and help them develop, and not fill them up with pills. There is no evidence these medicines help these kids develop,” Viktoriya says. 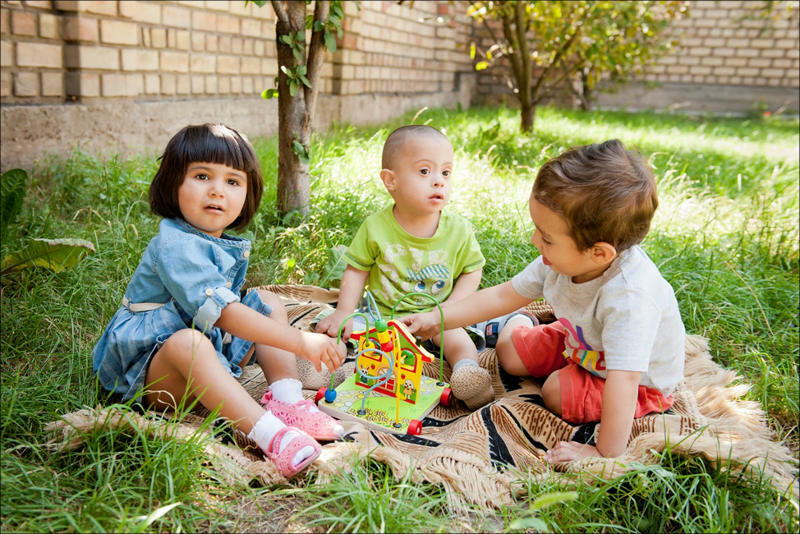 Sadly, children born with the Down Syndrome in the countryside in Kyrgyzstan receive even less attention: on top of being considered limited in physical and intellectual abilities, some even think they are cursed. The Kyrgyz authorities do not maintain a database of children born with the syndrome. According to a global statistics, the share of children with the Down Syndrome is the same in any country—1 in 700 children. That means there are 2,600 children with the syndrome in Kyrgyzstan. However, there is no such information available in Kyrgyzstan; even some medical records on such children do not indicate the syndrome. The medical records of the special children at the Junior Park kindergarten state they are “healthy” and provide no further information. One of the positive aspects of inclusive education at this kindergarten is that children copy each other’s actions and habits. It is necessary to have more typical children in such settings than special children. If special kids are isolated in their own groups, then there would be no positive effect. They would simply develop a mode communication, which only they would understand. On the other hand, immersed into an environment with typical children, special kids are encouraged to copy the formers’ habits, actions and other aspects of behaviour. At the same time, such inclusive mode of education is beneficial and useful not only for special kids, but also typical ones. They become more kind, merciful and tolerant. That said, they are not to show pity—they all communicate as equals. “Special kids, of course, cannot compete with typical ones in terms of concentration and perseverance. But our observations show they are able to yield good results. Every child here is showing growth in terms of social adaption and intellectual development. They are good in drawing and music. “On Saturdays, we host specific workshops on growth and hold consultations with the parents and their children with the Down Syndrome. It is very important to educate their parents, change their attitudes, and teach them work with us so their children are able to maintain those skills, which we teach them here,” Ms Hramtsova says. More and more families with similar issues are getting to know about the non-traditional kindergarten; even people from provinces are visiting the centre for consultation. A family from Issyk-Kul Region [in the Kyrgyz east] has recently visited the centre and, seeing the experience in Bishkek, decided to launch their own centre to help families with such kids. 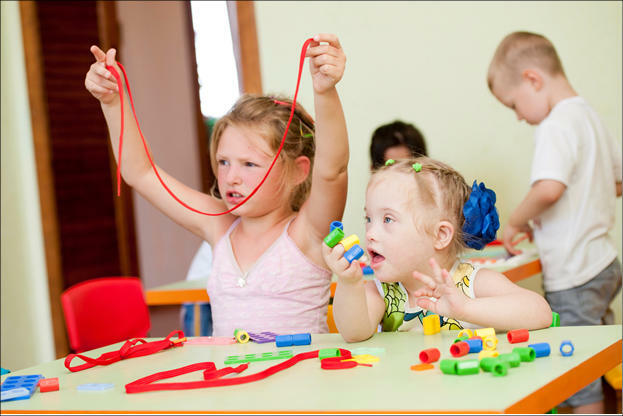 The kindergarten was designated as a pre-school institution since its establishment, where typical children and those with the Down Syndrome would study together. And the parents were well aware of where they were enrolling their children. According to the Kyrgyz ministry of education’s website, “The inclusive form of education is a successful method of integrating children with special needs into the society.” The website’s News section also reads there was a meeting about the current state of affairs and perspectives in the field of inclusive education, and that is happening while this very ministry is revoking the licence of an institution that is engaged in precisely in this field. Good news arrived when this piece was put together. At a meeting hosted by the association of private kindergartens, Ms Toktosunova was invited to participate in the aforementioned meting on the inclusive form of education. She was able to meet with the minister of education, Elvira Sariyeva, who was surprised to hear “the threat to withdraw the licence.” Someone called from the ministry of education with apologies the next day. It is not clear as to what prompted the ministry’s move—a collective letter the parents wrote, or the “buzz” in Internet forums. But we are hopeful that the education ministry will cooperate with such projects, which are actually shouldering this very ministry’s tasks and not expecting any assistance from the government.